CAD Drawing of ArduSat. Credit: Peter Platzer / Wikipedia. (Phys.org) —Japan Aerospace Exploration Agency (JAXA) has successfully launched an H-2B cargo rocket into space—a portion of which is bound for a rendezvous with the International Space Station. After it docks, two CubeSats—ArduSat-1 and ArduSat-X—held in its cargo module will be deployed into an orbit above the Earth. The two tiny cube-shaped satellites will be pulled from the same cargo module that holds Kirobo—a talking humanoid type robot designed to study whether astronauts might benefit from an electronic companion. The small satellites usher in a new low cost era in space technology—each will offer the possibility of non-professionals running real-time experiments aboard a real orbiting satellite. Both of the miniature satellites are loaded with technology, including cameras, ozone and CO2 sensors, a Geiger counter and temperature gauges. They also have an onboard computer running Arduino, an open-source platform that allows for controlling instruments aboard the craft. Arduino was chosen because it is an already established platform used by educational institutions and hobbyists alike. Both craft have a set list of objectives to fulfill before time runs out—both will plummet to the Earth at some point in time between three and seven months. Once its initial objectives have been fulfilled, the satellite will be made available to other projects run by customers on the ground. $125 will get a user three days worth of satellite time while $250 will get a whole week. Since each satellite is capable of running 16 experiments simultaneously, there will be plenty of opportunities for schools and other organizations to take advantage of this unique opportunity. Shortly after docking with the ISS, ArduSat-1 and ArduSat-X will be pulled from the cargo module by a robotic arm which will then release them into space. 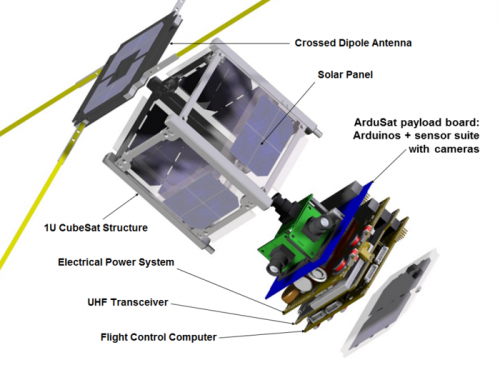 The two CubeSats were partly built in Australia and were also partly funded via a Kickstarter project. The aerospace company responsible for their creation is Nanosatisfi LLC—their stated goal is to "democratize access to space." They deployment of the two CubeSats is just the beginning they have told reporters. They hope to send up hundreds or even thousands of tiny satellites allowing almost anyone with a desire to perform experiments in space, a platform for doing so.